We need OOPS members to be thinking about locations for our paint outs. December is locked in but November and all of 2009 are open for suggestions. If you would like we can set January and February as indoor sittings where we paint a still life or model from life... an idea for those who don't wish to battle the cold weather. Seems there is some confusion... I have received a few emails from members thinking the October Paint Out set for the October 26th in Surf City requires a $25 entry fee and is a plein air competition... our October Paint Out is FREE and is NOT a competition. 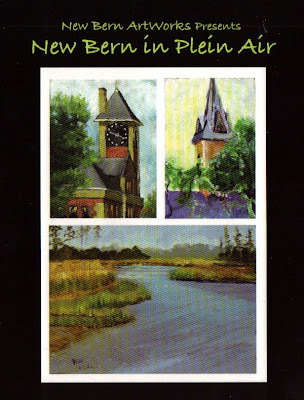 Our paint out is in conjunction (after) with the Surf City Artists Guild event for those wishing to participate. WHERE: Soundside Park, Surf City, NC at the park by the swing-bridge. 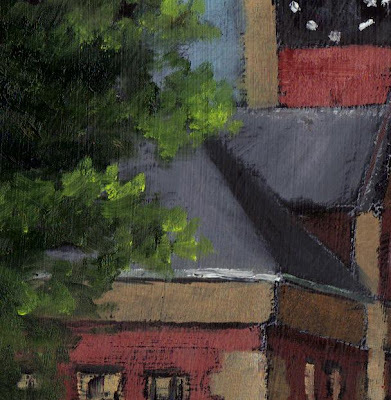 Last chance to register if you plan to compete in the "Paint in the Park" Paint Out... Registration due by the 30th! Just a note to those competing in the Paint in the Park Paint Out on October 25th and 26th... you need to mail in your entry form and entry fee NOW... they are due by September 30th. 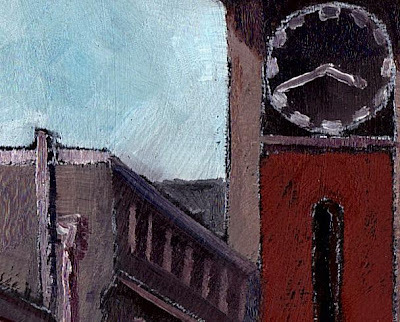 The OOPS October Paint Out will follow the awards ceremony on Sunday (26th) at 1:00 PM and is NOT a part of the competition... however... let's show Ellen and the Surf City Art Guild our support and compete if you can. In fact... he rode 21 miles on a unicycle for the "Family Ride to the Sea" fun day... I snapped these photos as he passed my house. Only a few slots left!! Morehead City - Sat. Nov. 1 thru Sun. Nov. 2nd. OOPS October Paint Out set for Surf City on October 26, 2008. In support of our friend and member, Ellen Elder, and her fine group, the Surf City Art Guild, we will be having our next official paint out at Surf City's Soundside Park (at the swing-bridge) in conjunction with the SCAG's "Paint Out in the Park" plein air competition. The competition has a $25 entry fee and you must be registered by September 30th to compete. The competition with run Saturday from 9:oo AM until 4:00 PM and Sunday from 9:00 AM until Noon with judging at noon. Our paint out will follow the awards ceremony at 1:00 PM and is NOT a competition and there are no fees involved. We wanted to set it up like this just in case there are those who may not feel up to the competition... However.... It would be GREAT to see OOPS support this COOL event and our friend Ellen. If you have never experienced one of these two day paint out events you are in for a REAL treat! if you are in the competition paint out your entry fee and form must be in by September 30th. 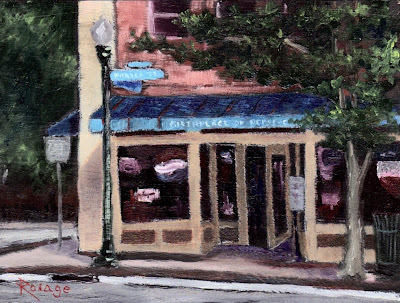 "Birthplace of Pepsi-Cola"... 6x8" Oil on Panel, en plein aire, 9-2008. 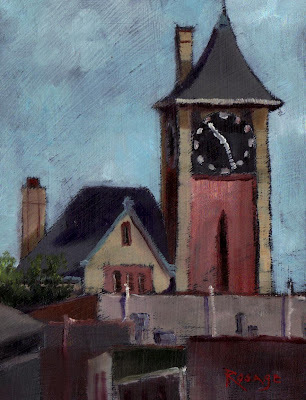 "City Hall Clock Tower #1, New Bern, NC... A View from Craven Street"... 8x6" Oil on Panel, en plein aire, 9-2008. 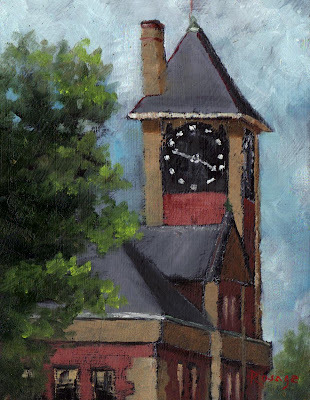 "City Hall Clock Tower #2, New Bern, NC... A View from Pollock Street"... 8x6" Oil on Panel, en plein aire, 9-2008. 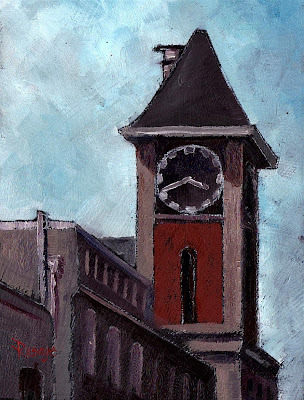 "City Hall Clock Tower #3, New Bern, NC... A View from South Front Street"... 8x6" Oil on Panel, en plein aire, 9-2008.